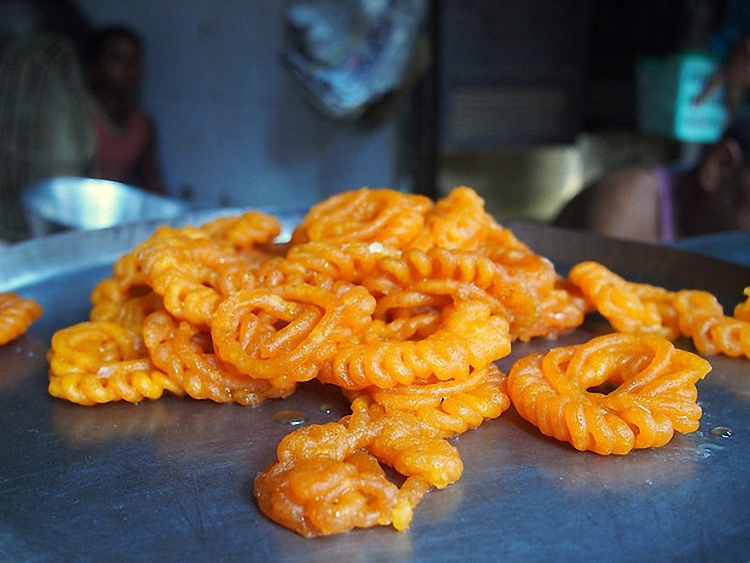 A huge part of my excitement over visiting Northern India was, of course, the food. Everyone I knew ranted and raved about dishes throughout the country, their eyes glazing over and unfocussing slightly, minds reeling with memories of tastes and smells. From those who had visited Rajasthan, tales of vegetables coated in spices and crunchy street snacks grabbed wherever possible flowed freely. I imagined tiny corner stalls piled high with treats, fried on-the go. With only a few weeks to visit and knowing I would be on a tour where some meals are included, I wanted to get in as much exploration as I could. My mum, to her credit, came along for the ride almost all of the time — from streetside chai tea to fried chickpea flour snacks and more. We did not get sick once, but we certainly tested fate a few times. To be completely honest there was an afternoon of my rolling around clutching my stomach on the bed, the result of a lassi that I was almost certain was extremely watered down, but happily nothing violent came from it. A few hours later, I was back to my usual hijinks, sniffing around for a street dosa for dinner. Notwithstanding the fact that many Indian meals do have rice, Northern India’s tastes often skew toward wheat — more than I realized. While Punjab is referred to as the “breadbasket” of the country, during our time in Rajasthan we were showered with wheat add-ons to our meals, local breads such as chapatis and rotis for all. Well, except me. My guide Manu would wrinkle his nose at the rice offerings, explaining he was from Rajasthan where wheat is the chosen carb for his family. “You and your rice,” he would tease, shaking his head. Of course, this just meant that I offered him rice at every opportunity I could, purely to annoy him. But with Manu’s guidance and a lot of exploring, I was also able to find all sorts of other non-rice carbohydrates to keep me entertained. I should note that I am extremely sensitive and that I have celiac disease, not a milder intolerance. Eating foods fried in oil that has been contaminated with breaded products will get me sick; anything with even a little soy sauce will do the same. And so on. I mention this in the event celiacs stumble on the site, to make clear that with heightened sensitivity in mind, I have compiled the following list. With breakfast included in our guesthouses, many catered to Western tastes, and the staff seemed confused about my refusal of the breads they had on offer. I learned quickly that a fast and easy alternative was poha, a dish made from flattened rice that is fried with turmeric, chili powder, onions, mustard seeds and more. Easy to make and satisfying, it goes quite well with eggs. While traditional roti is made with wheat, we saw millet growing along the long drives in Rajasthan, a staple food I tend to forget about when I am home. Pre-made bajra (the word for millet) rotis are not advised as often wheat is mixed in the batter. However, many guesthouses and restaurants were more than happy to make a pure bajra roti, which I was then able to use to soak up my sauce from dinner. The breads are a dense and slightly difficult to digest alternative to the lighter wheat version, but went quite well with the more sauce-based curries and stews. Here is a palak paneeer, a spinach and soft cheese dish famous in Rajasthan, with this celiac-friendly bread. 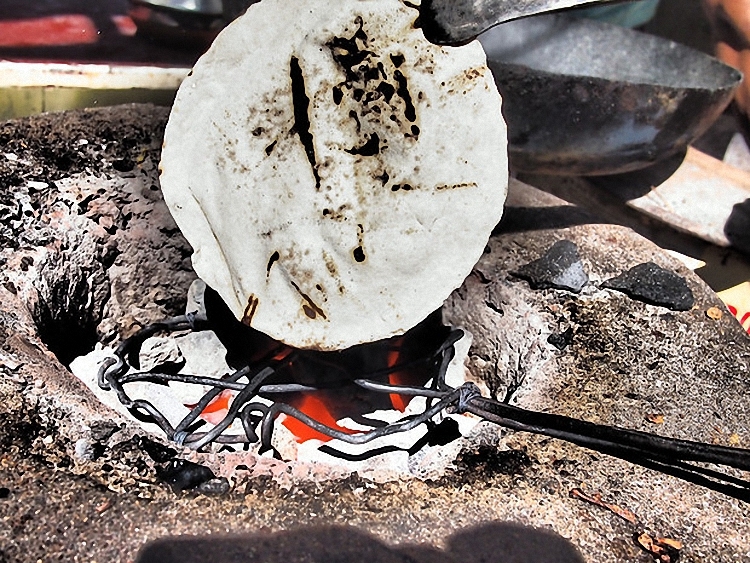 In addition to millet, some Punjabi restaurants and the occasional street vendor will also make makki ki roti, corn-based bread that is also gluten-free. Occasionally vendors will dust the finished product with wheat flour — or so I was warned. That said, I never found any that did, and I did not get sick. Dosas are a South Indian crepe made from lentil and rice batter and spread thin like a pancake and grilled, either with filling or without. For those concerned about food sickness, the chutneys that accompany these dosa on the street ought to be avoided as many are uncooked sauces. The dosa itself, however, makes for a great meal. 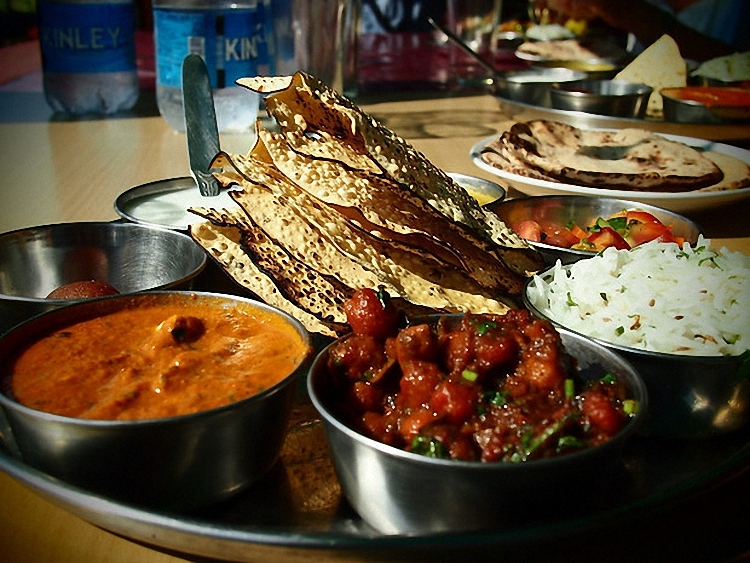 Despite traveling in the North, there were often South Indian restaurants in town for a sampling. In addition, in the markets of Jaipur and Jodphur and in Bikaner I found small dosa stalls on the street, making a potato-masala filled masterpiece for only 50 cents. These crispy lentil or black gram crackers taste great when dipped in tamarind or mint and cilantro chutneys, and have long been a staple in my kitchen, no matter where I am in the world. 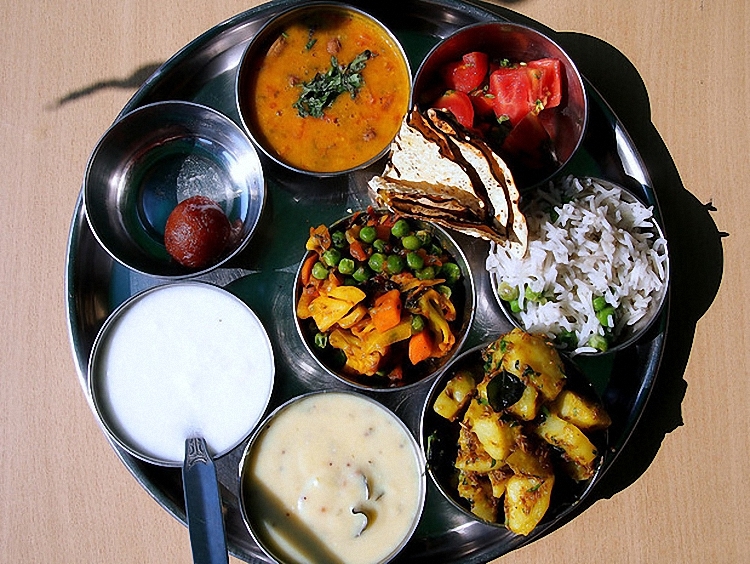 In Northern India they were found at the occasional breakfast table, but usually accompanying a curry or sauce-based meal or atop a plate of thali (see below). Gluten-free, they are the perfect opposite to a fiery main dish, crunchy mixed with soft and savory. As I note below, where meals come with a chapati or roti included, it was never an issue to substitute a papadum instead. Papadum. Extra papadums for meeeee! While many of the street snacks were off limits, pakoras were found in most of Rajasthan, and were occasionally the only available item on the menu that was, as the group started calling it, “Jodi friendly.” Made by taking vegetables or paneer and coating them in spice-filled chickpea (gram) flour and then deep-frying, they were cheap and abundant. While not the healthiest (nothing deep-fried is), they were nonetheless an easy alternative when we stopped for a snack, or in-between main meals. 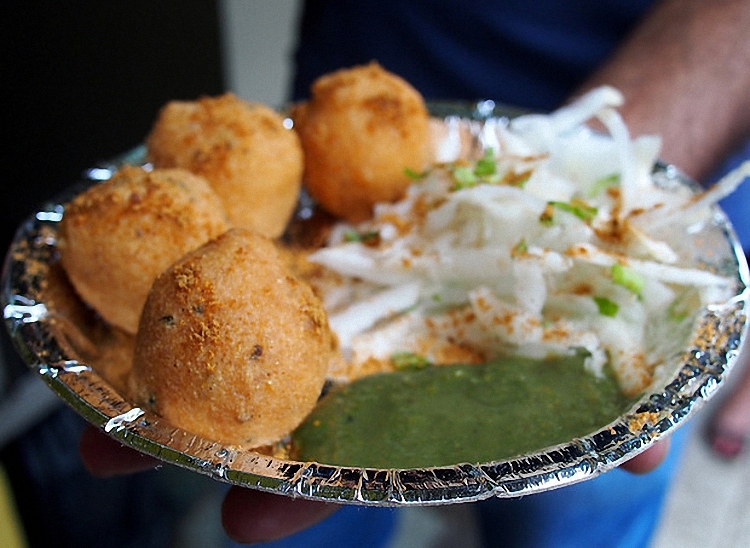 Pakoras or other chickpea snacks (like the fried dal balls below) were primarily found on the appetizer list at restaurants or at chaat (savory snack) vendors on the street. Vegetarian thalis were a great option too, a metal tray filled with small metal cups and containing a vegetable dish, yoghurt curd, dal (lentils), rice and pickled vegetables. 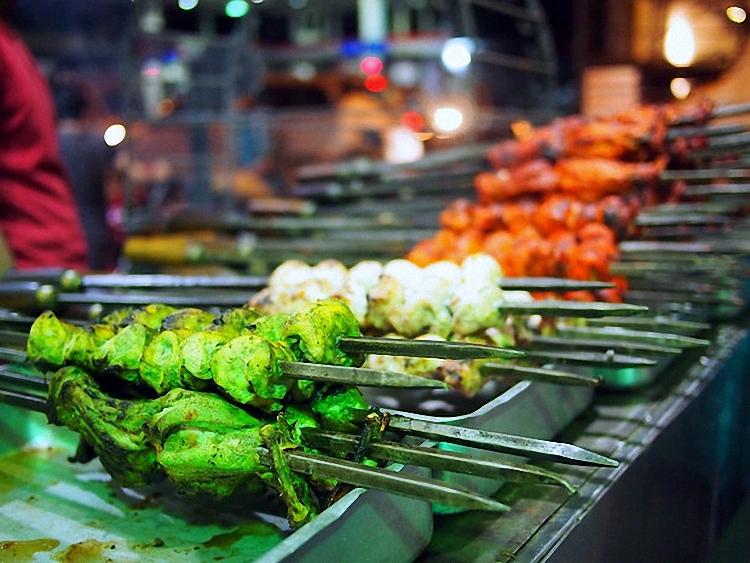 Depending on the style of thali (Bengali versus Punjabi versus Rajasthani and so many more) your options will vary, but overall a very safe choice for my stomach. Keep in mind, too, that even if the dish comes with chapati or roti, you can almost always ask for extra rice or a papadum instead. Thali of champions in Udaipur, at the vegetarian restaurant just across from the main temple in the centre of town. Note: celiacs cannot eat the dessert ball, a sweetened wheat-based treat. Lassi, a delicious yoghurt drink served savory or sweet, was highly recommended by friends who had travelled to India as both a refreshing snack and a way to ensure my intestines stayed full of the right bacteria. From the cardamom and lemon version I tried in Jodphur (THE BESTEST) to the saffron and almond iteration on the streets of Old Delhi, lassis are everywhere. Note: Beware those stalls that use tapwater to water down their lassis. With the exception of one restaurant in Jaipur, I never had any lassi issues and almost all the lassis were thick and creamy, not watered down. I devoted a full section of my Northern India overview post to bhujia, and with good reason. This spiced chickpea flour snack made famous in the city of Bikaner was both addictive and filling, and kept my hunger at bay between meals. While I always asked if it was 100% chickpea (gram) flour, the answer never wavered. Pre-packaged bhujia is also available throughout the region in foil bags, and it too was wheat-free. Not limited to India, biryanis are found and consumed in many different countries, a fragrant, sautéed spiced rice with a recipe that differs depending on location. While pulao is also made from spiced rice and meat or vegetables, there is a difference between the two. Paraphrasing from a chef I met in India, generally biryani contains much more spices and involves boiling the rice separately and then layering the meat and vegetables and cooking it together once again. In contrast, pulao is made with less spices and meat but the rice is added uncooked, a milder version than in biryani. In addition, pulaos are usually wetter as excess liquid after cooking is not drained. Regardless, both were available throughout Northern India at almost every restaurant, and though I prefer the spices of a biryani, a vegetable and egg pulao became a comfort food during my weeks in the region. Dal, lentils, are manifold in India and there are far too many dishes to try to list here. Suffice it to say that my favourite afternoon snack was dal tadka, yellow lentils with spices, and jeera rice, which is rice spiced with dry cumin seeds. Simple and delicious. Other tempting dal options include dal makhani, made with black lentils instead of the lighter yellow version. Despite being quite wheat-heavy as a region, Rajasathani curries never had wheat in them to thicken the sauces. Chickpea flour was used instead. I asked often, and the reaction was one of confusion – why would we do that? From paneer (soft cheese) cooked in spinach or smoked in a tandoor, to grilled meats or vegetables, to chicken curries, all were available with rice and none got me sick. Sides to meals included grilled okra with cumin or potatoes with spices, with none of the vegetables ever causing an issue. Another go-to was the halal grilled meat spots I found, which had chicken on the fire, roasted after being marinated in a variety of sauces. From the green mint and chili chicken to masala spiced wings, none had any wheat in their marinades, and we were sure to ask repeatedly. And, let us not forget chai tea, available on the side of the road in tiny clay or plastic cups, boiled fresh with spices and thick milk. I couldn’t smell it being made without clamouring for a cup, drifting over to whoever was crouched over a tiny stove, bubbling tea in front of him. There is magic happening here. 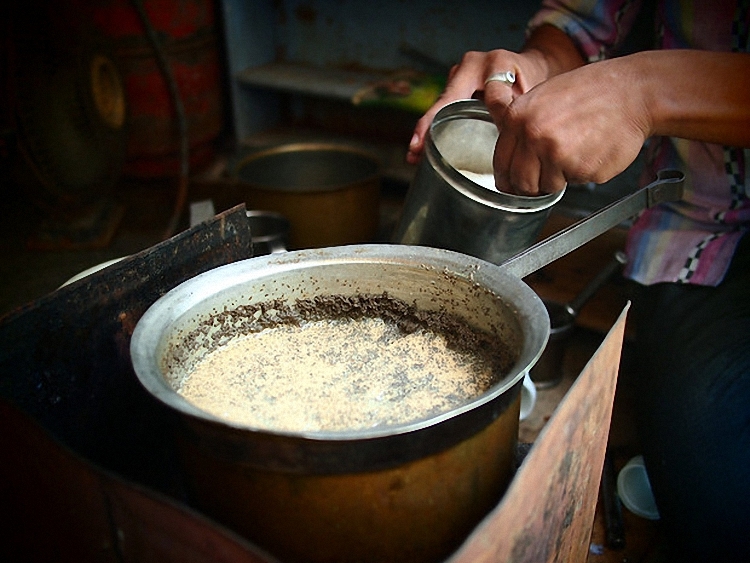 Chai in Chandelao, Rajasthan. Despite the large variety of snacks and dishes to choose from, the regions snack foods are predominantly wheat-based. Below is a list of foods that ought to be avoided for those with celiac disease, even though they look absolutely delicious. Puris are all off limits. Pani puri, a tamarind water served in a thin, curved wheat puff, is everywhere on the streets and was hard to resist — but I did. Hing, known in the west as asafoetida, is a strong spice made from the root of an herb called Ferula. Unfortunately after it is ground it is usually mixed with wheat flour. Also unfortunately, it is used quite commonly in Indian food. Always helpful to ask if there is hing in the chutneys or soups. Found throughout the day on the streets and in restaurants, with wheat flour triangle dumpling hosting a filling of either paneer or vegetarian (potatoes and peas and spices). The bhaji part of this fast food dish — a spicy tomato and vegetable stew — is safe, but it is served with pav, a white flour bread resembling a hamburger bun that is used to sop up the stew. Solution for me was to just ask for the bhaji, to the confusion of the street vendors. 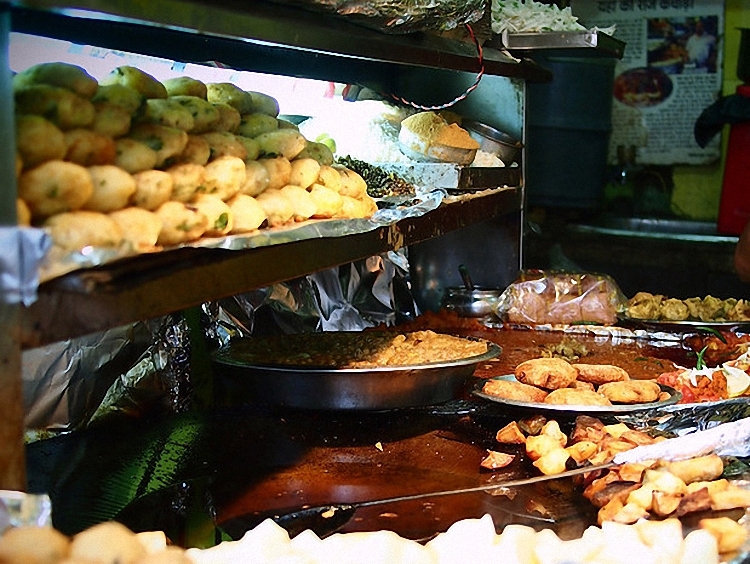 A crispy fried snack filled with mung beans, the outside of kachori is wheat based and must be avoided. A popular snack made from lentils, a baked wheat ball and a sweet powdered cereal, this is off limits but available in many Rajasthani cities, most notably Jaipur. Round, bright orange desserts made with fried dough, both are off limits (though they looked so good). For desserts, I mostly ate fresh fruit or more lassi. Original article by Jodi from www.legalnomads.com : one of the best travel & food blogs on the net!